Soldiers are the ones who enforce the monster with superior firepower, which is their primary role. The most effective they are when they stay close to the monster, but every soldier has also alternatives for some further distances. In addition, they often have a few tricks to survive, but even their wily equipment is usually offensive in nature. This makes the role of very simple in understanding, but of course can be very different in practice and in the play. Ironically, the class ability of soldiers is not so much offensive - The personal shield is cursed conceptually simple: If you activate it, your soldier is invulnerable for a few seconds. Needless to say, you should therefore rather not combine simultaneously with skills such as Hanks sign him, and the premature termination of a field is not recommended. Of course you can use the seconds gained to go more on the offensive and press damage. But often you should use the shield tactically, for brief retreats for distraction (many monsters need a surprisingly long time to realize that their attacks not get anything done) or to secure a revival. Medics can heal you too, while the shield is active. And you can also shield you when you're gone to ground - this is your ally more time to scare the monster and revitalize. Markov is the standard Assault and can be selected from the start. Probably the most destructive weapon in the game has no first-class range, but many other benefits. In the fight against multiple smaller animals shines its ability to meet many goals at once. In the fight against very moving targets its immense precision by the continuous beam is enormously useful. Above all, it depends on beastly damage. If you can, always sets the flash gun as a weapon and your other weapons and gadgets just as a bridge. There are few things in the game, the small get a monster in the short to medium distance so fast. Shoot it empty in the fight, which you can protect yourself through your shield, then changes to the mine or your assault rifle - as soon as it is recharged and you are within range, immediately take the flash gun and keep up the pressure. Less damage, less precision but larger range - this is the assault rifle. In the medium to long distances, which does not reach the flash gun, or in the alternative, if the electric gun must be recharged. Use it in battles, because usually you are then too far away. You can arrange good and consistent damage, but do not expect any miracles - this is the lightning gun. Nevertheless, a solid weapon and much better than nothing. These mines from which you can create up to five simultaneous, first sound very simple: you shall, make sharply after a few seconds, and if then an enemy gets too close, they wreak havoc. In fact, the mines are more versatile than you might think. During the persecution they can actually interpreted as traps for the monster, preferably in the bushes, where the monster looks bad, or right on the edge of cliffs, so that the monster triggers directly when it kicks off a cliff and climbs up. Furthermore, you can set traps before starting the fight with the monster. In fact, you can use the mines but also in the fight for profit. The obvious and not very clever variant is to throw the monster almost directly under its feet. The course works better when it is deflected. Also bottleneck that can utilize to escape the monster and should be mine in the battle quite times, for example, while the flash is charging gun. But you can also, and this is also very useful, easy to pack several mines in a narrow range, in the own team can pull during the fight, for example, to heal or to use other skills. Also fallen comrades, you can screen so as to ensure the revival. Hyde is the first assault, which must be unlocked. This is done as soon as you have all the skills Markov improved by a star. A classic in video game history. The flamethrower does exactly what you think: It depends on extreme damage at very short distances. Whenever you have the option, you should use flamethrowers to attack to inflict as much damage as possible. The monster then takes six seconds further damage while it burns. During this time it can not regenerate its armor. In addition, the visual effect of the flame thrower has a few special features. Hardly any weapon in the game is so prominently visible. The psychological effect on monster players should not be underestimated - a monster sees a flamethrower, it will want to flee as soon as possible or go to attack Hyde, in the latter case use the personal shield. In addition, the effect is bright and invasive. If you shoot a monster player with the flamethrower in and above, it may well be that the monster temporarily can not see anything. Also, you can then use other weapons conspicuous in your team, as Hanks laser cutter conceal. Also a great choice for the constant damage over a longer range than the flamethrower. The Minigun should not be used over long distances, but certainly in the medium where the flamethrower stopped going arrived. Over long distances they spread too much. Thanks to its immense rate of fire and its huge magazine, the Minigun is not only a valid alternative to the flamethrower, but often even better - both arms are alternately a deadly combination. The many balls Markov, with the Minigun also great exploit vulnerabilities of the paramedics. If numbness and weakness on the monsters, answers it close and keep it. There is little in the game, which causes more damage - especially if you have previously set on fire and thrown in as well a poison gas grenade that monster. Unlike Markov other weapons, the damage is not so directly and the possibility of using more tactical. In a large area in which it fired the grenade to poison gas spread and cause great damage depends six seconds. This is great if you want to push the monster from a particular area or cut his way. Also, if you suspect or know that the monster hiding in the vicinity, it is worth a grenade. The downside is that your own team is slowed when it is present in the gas. In any case, you should grenade in front and your team to throw when you're just about to pursue the monster. However, sometimes a toss worth in battle. If you somehow manage that the monster will blow your flamethrower is in poison gas and is raked from your Minigun, then it will take much damage in no time. Parnell is the final assault, which you can freely play. To get it, you have all the skills Hydes improve a star. Parnell likes to go up close, and its fully automatic shotgun is an expression of this fact. The insert is really not complicated - it runs as close as possible to your destination, holding the trigger down and aimed at massive damage. Even more interesting is how to combine these with other weapon skills. Hanks shield generator is of course an ideal complement, but also of the soldier's shield can be very help to survive the turmoil. For best results in terms of damage, you should of course first activate the ability of super-soldier, if you can afford the loss of life. Therefore, it makes for Parnell in two respects sense to work closely with a paramedic: The healing can relativize the negative effect of super-soldier and medics caused by weaknesses are effectively utilized by the stray fire the shotgun. For distances Parnell has a multiple rocket launcher that can fire volleys of four missiles in a short time. Of course you have surface effect, but in contrast to the missiles from bucket completely unguided - they just fly straight. Fortunately, monsters are indeed very large. But Parnell rocket launchers aimed for more damage and the missiles to fly faster. Of course also benefits the rocket launcher on the ability of super-soldier, but as the reloading takes longer than the shotgun, a timely weapon switching is more advisable. In general, we use the rocket launcher often better than bridging until you are close enough for the shotgun again, should be changed. Parnell can drive into a berserk mode in which it moves much faster, fires faster, faster and faster reloads his weapon. The downside to this super mode is that Parnell each time 20% of its life energy loses if he uses the skill. A classic case of "high risk, high reward". Therefore, it is not advisable to reflexively use super soldier in every fight. When Parnell already is struck, for example, this ability can mean his imminent death - in which case it makes more sense to use the shield to survive and wait for healing. In general is good coordination with paramedics and supporters, to play, especially Hank for his shield generator, an important factor in Parnell effectively. If you have mastered but the rest of the concept is very simple: run to the enemy, while shooting rockets, then Super Soldier near and melt due to the shotgun monster. Simple and effective. The Medic is the counterpart to the assault and one of the classes with the most sharply outlined task field. While trappers and Support routinely have to switch between open and defensive and the Assault only pays attention to the monster, you have a Medic task is to support your colleagues by any means. The only class it is absolutely inappropriate to inflict damage to the opponent. Therefore, avoids any offensive - die you; your team has no chance to regenerate his health. Of all the classes of the Medic should be kept alive most urgent. By pressing a button it creates a small aura within which and all related team members are healed. Especially in the middle of battle into the tightest spaces, this ability is extremely useful, not individually every hunter, but to be able to heal all at once. Val is the standard support and is available to you from the beginning. The Medi-gun misses a concentrated beam cure enormous distance that is similar Hanks shield projector. While the support of each colleague donates a shield, Val heals mate. You can also use the Medi-gun defensively both offensively by either directed to a hunter who is being attacked by monsters or heal a weakened friend. Respect the offensive use but be careful not at the same time to target the same colleague Hank, insofar this is part of your team. Considering also that the Medi-gun can not be used permanently and must be regularly recharged. Thus use them pointedly. The stun gun slows down the monster and marked it at the same time, so it is very useful in different situations. Shoot about an opponent just before he can take flight when the mobile arena collapses in order to continue to follow him. It is also useful to shoot the enemy before the start of a battle to slow its movement. 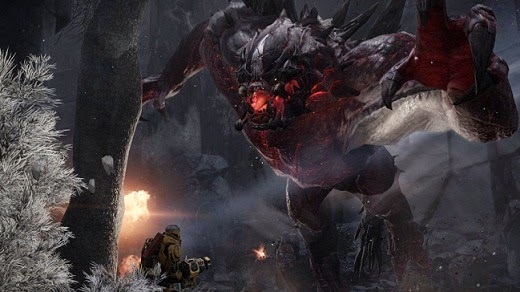 Despite its considerable Biggest sniper rifle is not intended to cause damage to the monster. Instead, create hit vulnerabilities that can be taken by your team targeted under attack. However, this is an absolute luxury that you should definitely made if you already checked the enemy with the tranquilizer gun and all team members have completely healed. Lazarus is the second Medic character. To unlock it, you have all the skills of Val to improve at least one star. The Lazarus device can revive its fallen colleagues in one fell swoop. However, since only a small proportion of health is restored, you should use immediately after your healing surge, so that the hunter befriended completely is back on his feet and not lying on the ground after a few hits again. The personal camouflage works basically like the stealth field of the support class, only that this ability is limited to you and you are therefore not dependent on outside help. Once activated, Lazarus is immediately visible and can thus escape into sticky situations before the monster or sneak about secretly to a fallen colleague and revive this. The sniper rifle of Lazarus works essentially like that of Val. Again, it is not your job to harm your colleagues special vulnerabilities on Monster "free to shoot". Intersperse your shots as much as possible to reveal many sore spots. Caira is the second unlockable Medic class and is available once you have all the skills of Lazarus improved by at least one star. The healing grenade launcher misses with an arc-like trajectory grenades that explode immediately and generate a circular healing field in its environment, all hunters are healed - including Caira even if it is in the appropriate range. This capability is particularly well suited several team members once again. With this ability Caira can run very quickly and also colleagues provide an increase in speed as it passes behind them. The acceleration field is particularly well suited to hunt as a team the monster or to put themselves in dangerous situations safely. The Napalm Grenade Launcher is the only offensive weapon in the entire Medic Squad and makes Caira thus by far the most aggressive of its kind. When struck the enemy catches fire and suffered over a small period of continuous damage so shot is enough. Following other colleagues can be the only remedy again. The Trapper supports the team primarily for his unique skills to track down the monster and fixed. Especially in the early minutes of the game this character is absolutely crucial. If we succeed as a trapper, yet to catch a creature at level 1 or 2, the match is usually decided to your favor. Each Trapper has the ability to let a mobile arena appear in which the monster is trapped for some time. The dome spreads after activation in a matter of seconds and covers a large radius. The beast at this time is not within this range, it remained at large, the arena should be demolished immediately in order to shorten the waiting time for a new one. In addition, the shield breaks as soon as the trapper to the ground goes - that has not offensive to the opponent to when it is trapped beneath the dome. The sooner it also succeeds in a round you nail down the monster with the mobile arena, the greater are your chances slay it. Gerde on the first stage have a full strength team creatures oppose little. Maggie is the default Trapper and is available to you from the beginning. Daisy is a loyal four-legged friend and a dog not dissimilar. Daisy also as the man's best friend is characterized by an excellent sense of smell that allows your companion to autonomously search for the monster and just about whose footprints are visible for all team members to leave. Bear in mind, however, that the Daisy always only follows enemy; its quasi always lagging behind a step. Therefore tries to cut off the beast and follow him not only blind. Stay tuned for the symbol on Daisy's head, by which you recognize where "search mode" the animal is. It has the snout to the ground, the monster is in sneak mode. Follow your companion once not own a track, you have the four-legged-around a little on the map until it reintroduces the track. In the fight Daisy can not actively deal, but fallen team members to revive. Harpoon traps are small sentry guns, of which Maggie can place up to five pieces simultaneously. You need a moment to focus down (in this period, the monster can destroy up - so they should be well hidden), then shoot but automatically harpoon arrow on the monster when it is in range, and thus restrict its strong movements, until it has destroyed with a few punches. This ability is for example very well suited to take some time to find the trapper when set the monster in the mobile arena, waiting for reinforcements. Maggis firearm has a high variance, but is aimed at comparatively much damage, so it is primarily intended for close combat. Set the beast about with a few harpoon arrows fixed and then raked it with machine gun. Pseudo-gentleman and Griffin is the first trappers. To select it, you have to improve Maggie’s all equipment by at least one star. Griffins sound sensors are lifeless counterpart to the faithful Daisy, Maggie leads around with it. Put it on the map distributes into the soil and it will automatically sound an alarm when the monster is near. Unlike Daisy your running here is not active in the footsteps behind, but conduct yourself more defensive and wait for the beast runs past your sensors. Particularly suitable places for setting up are narrow and feeding areas. Also place a sensor, if you have the monster trapped in a mobile arena, so that your comrades immediately see, where is the enemy. This somewhat unconventional weapon is not intended to cause harm, but to slow the monster strong - pretty much like Maggi harpoon traps. In the skin of Griffin herself active effort but a long cable to the beast and put it thus adopted immediately. You can use it to save other team members before the invading enemy. Closing the link of your cable also independent, shortly before it does the monster, as your weapon in this way is faster to use again. Griffin Spitting Lead depends only very little damage. Use it only if you really have no other option and is aimed at the weaknesses of the opponent. Abe is the second Trapper, which you can unlock. To obtain it, first you need to improve Griffins skills. Abe's arrows are the most demanding method to track the monster if used properly, however, extremely valuable. Shoot with it on the monster to mark it for long time, which is especially useful before disintegration of a mobile arena, since you can stay immediately on the heels of the cattle in this manner. Also mark so many wild animals as possible. If a tag animal eaten by the monster, it will be highlighted. Stasis grenades slow the monster, which you can just weaken strong in melee. Concentrate your team's attack on the enemy should apply especially your grenades in large numbers to slow down the Beast as much as possible. The special shotgun aimed at acceptable damage, but shoots imprecise, the faster you can fire them one after the other. Give therefore slow, controlled shots (ideally the vulnerabilities) to limit the scattering as low as possible. The role of supporters is perhaps less clearly defined than those of their colleagues, for repertoire includes offensive, defensive and tactical options that will be used carefully depending on the situation considered. Massive firepower strong buffs for the team and some tricks on documents - as supporters have to develop an eye for it, when each aspect of your class is required. For support but are then also amazingly versatile and useful in almost any situation. Supporters can allow to become invisible, the standing order comrades and himself. She does not last long and is abruptly interrupted when the Camouflaged use a skill, a piece of equipment, weapon or jetpack. These severe restrictions don’t conceal that the stealth field is immensely powerful. Whether it is your team to aid escape, you can better position to attack the monster, or simply the enemy in battle, makes for some confusion, the cloaking field does all these tasks with flying colors. Also for revivals, it is best suited. It is especially useful in conjunction with the medic Lazarus, who specializes in reviving fallen team members. Which can indeed camouflage themselves to better get the job done, but often not enough short time, and a few extra seconds can make the difference. Hank is the default character support and is available from the beginning. Hanks energy shield allows him to one of his comrades (but not himself) to be surrounded by a protective shield that must first be broken before the protected hunter takes damage. Hank has his comrades to keep the shield generator in sight, which also has the disadvantage of a clearly visible blue beam between Hank and his protégé arises - to take a good opportunity for a monster Hank targeted them. For the range of the projector is excessive - put yourself with the jetpack to higher places and your friends from there, where the monster can reach you worse. Do not use the energy shield, if you have, for example, your soldier uses his invulnerability or if one of your mates, no attention from the monster - it draws attention to ensure that only you and your protégé. The shield has a limited capacity before it must be recharged and should be used specifically and pointedly. Every few seconds, fire a thick armor plate is simply not there. Therefore, you should also selectively shields, not all the time - the projector does not charge for its energy while you use it, so use it only occasionally, when a team member is just really attacked in order to get the most out of its load. Only Hank has a frighteningly powerful weapon. His laser cutter is a kind of heavy machine gun, with which you can fire off in a very short time you have hundreds of powerful projectiles. You might think that Hank the face of this firepower best should primarily shoot with the monster, but that's not necessarily true. As with his other skills, it makes the most sense, for example, when the monster is just before exits. Otherwise, the team simply lacks namely Hanks versatility and support. Apart from that, the yellow laser gun is extremely obvious and you will inevitably draw upon, and then pretty soon the target of the attention of the Monsters. If you have to protect just anyone or disguise when your Medic has revealed a flaw or if it is time of superior firepower easy to overrun the enemy brings the laser cutter out, use it sporadically and then put it away again, when other skills are needed. As the name suggests calling the orbital strike a number of artillery shells on the battlefield, the rain from the sky on your unfortunate target. It is important that there is a time delay between the call of the air shock and impact. This ensures that the ability really is not as powerful as it sounds - the monsters are very mobile in general and often back away before the bullets hit. This means in plain text that you have to use the orbital strike wisely and at the right moment to really to get maximum efficiency. Of course you should practice to shoot the monster in the race, but that's only in isolation, the best tactic. In conjunction with the harpoon traps the trapper or the tranquilizer dart Medic is the orbital strike more dangerous, so let the monster rain, if it can not move freely. The orbital strike may also be a defensive option when a colleague went to the ground, using the orbital strike to give your fellow space for revival. Another situation in which the orbital strike can be useful when the monster is already at the maximum level and the generator attacks. Since it is in this rule staying in front of his goal, which is a way to inflict massive damage in a short time and then maybe to win the match yet. Bucket is the first additional support character you can unlock. To get it, you have all the skills Hanks improve a star. Bucket gladly kept their distance and still effective, and its main weapon reflects this style of play. After you've shot with the rocket launcher, the rockets to the position to which you then aims, you may be able to lead. In addition, have the missiles a proximity sensor and that is good form, a blast radius in which they inflict upon detonation damage, so you don’t have to meet exactly it is enough if you direct the bullets in the general direction of your goal. The rocket launcher experienced players can lie down right tricks, for example, shoot around corners. This is useful when the monster escapes and tries to break through the line of sight - for an experienced bucket it is definitely an option, while still chasing him several missiles. May also in normal fights and should remain Bucket thanks to this weapon rather at a distance and ambush the monster. This should however only happen if the turrets were appropriately distributed. If you engaged too much the monster in your cannonade on the skin, you disguise, go back at a distance and repeat the game. Bucket can place up to five automatic turrets in the area, both on the ground and on surfaces. The little buggers judge alone is not much damage, are in the ground but quite dangerous, disruptive and useful. The obvious option is, of course, to distribute them at the beginning of a fight in the middle of nowhere and so to keep the monster in crossfire. That will interfere with, among others, going to eat to kill fallen comrades and distraction it provides as well. In any case, you should put it all guns close to each other, because a single surface attack of the monster can then erase the fragile towers in one fell swoop. Place them at various locations around the monster, even higher places in order to get the optimum out of them. Another alternative is to place the towers in the pursuit of the monster again and again in the thicket, say the bucket when the monster comes along. By the way, turrets automatically attack all enemies within range, and animals. Actually, no drone, but rather Bucket head. Bucket screwed from the turnip and let it fly or float through the area to hold. If he finds the monster after monster out and its sights, it can highlight it, thereby Bucket and his team can trace it better. The pertinent question is: What happens in time with buckets body? Which is stupid around in the area and is very vulnerable, so you should not use the drone when it's just not sure. Even with an active pursuit, where resides the monster, you should think twice about whether you want to use the threats - in that bucket can not move during use, it necessarily falls back and then you have only find connection to the team. If you play very aggressively, you can watch the drone of course right at the beginning of a match, use and try to track down the monster as soon as possible. This can work, but makes sure that your team moves on not too far without you and the monster you might coat alone in the start area. An ideal time is on the other hand, when the dome of a trapper collapses equal and the monster is behind flee - launches drone shortly before, and the monster right before it starts its flight. With Cabot you get the third standard support. Improves all abilities buckets around a star, allow Cabot is available. The damage amplifier is a continuous beam, the Cabot can shoot at a target, so it gets more damage from other sources. The course makes this device an ideal addition to the heavy losses soldier class. If then the vulnerability is exploited with a nurse, an amazing amount of damage can be done in a short time. Natural good coordination is of the essence Cabot must consider carefully when to attack and when directly rather gain makes sense. His railgun - described below - is often more useful in situations where the monster escapes and Cabot still can inflict additional damage. In direct tumult, and with a captured monster damage amplifier is a "standard weapon" is usually the better choice. Cabot's "main weapon" is a single shot rifle with very respectable damage and a huge feature: It can shoot through solid objects. Whether thick rock walls or entire forests, with the rail gun meet your goal. This makes the rail gun an ideal addition, but of course other education options are also valid. Although the rail gun aimed reduced damage when shooting through objects, but it can also have hit enemies that are otherwise inaccessible. In the tumult and in the presence of a soldier of the damage amplifier is often a better choice.